Even if you need us to bring in a door installer, we’ve got you taken care of. That’s our job when it comes to being the leading service company for doors in our NY, NJ area. On top of that, we made the process so simple that it breaks down into 3 steps. See for yourself. 1. Make your presence and need known. While we would love to be mind readers, we’re not. This is why you need to contact us via the High Gate Doors website or by phone. Let us know what your particular needs are and we’ll start putting the solution into motion. 2. A door professional will be dispatched to you. If your issue is an emergency, we’ll be sending one of our employees right to you. If it can wait until the next business day, we’ll let you know what time to expect the arrival of our team member. We got the rest from here! 3. We follow up to see how things went. Just to make sure we stay at the top of our game, we’ll be in touch with you after the job is finished to find out how our team did. We love to find out where we could improve or if the experience is on-point right out of the gate. There you have it folks, one of the easiest door repair solutions available in New York to this day. Now that you have that in your hands, what are you waiting for?| Skip the rest and enlist the best! Ready to use the best for results that you can put to the test? If you’re ready to use the leading source for a door installer, or for door repair, just follow the link to our contact page. This is where you’ll be able to find our online contact form as well as phone number to use to reach out for your interior and exterior door needs. Once you make the call, we make sure the load is taken off of you. Don’t forget about our commitment to customer satisfaction. We will make sure the job is done right, even if we have to come back out and do it after the fact. We refuse to be the company to let you down and charge additional fees to fix something that was already supposed to be fixed. The best NYC door installers are found at High Gate Doors. High Gate Doors prides its strict hiring process and unique working environment. It has helped provide our customers with a level of door repair that they can’t find among our competitors. It also paved the path to being the source for those who need interior and exterior door installers over the years. Whether it’s our extreme focus on providing nothing but the best customer service, stocking just about all brands of doors, or our attention to detail that has been the root of some of our greatest breakthroughs, our growth has been incredible (especially within the New York area). We felt the best way to take it to the world was online, via the World Wide Web. Attention to detail is critical, only the most focused eyes make it. An approach that’s straight-forward and easy to understand. We know that our customers want to know what they’re paying for and that’s why all of our door installers are trained to keep things simple on both the interior as well as the exterior. No sense in confusing others with a bunch of technical jargon. This very well could be why many see us as the easiest to work with of all brands of our kind. Commitment to evolve with ongoing education and refined methods. There are breakthroughs every day, and the door industry definitely sees its changes because of this. We ensure that everyone here at High Gate Doors continues to receive new training to cover changes/improvements of all brands seen here at High Gate Doors. Not to mention, we continue to refine our methods to ensure that they’re as effective and efficient as possible. Educated customers leave as extremely satisfied customers. Each door installer works hard to make sure that customers remain informed and knowledgeable about the services we provide as well as the materials we use during the job. This approach has left us with one of the best customer satisfaction experiences around. Ensure our customers are satisfied at all times. Through ongoing and streamlined communications before, during, and after the project, we’re able to deliver exactly what each customer wants. Sure we can’t do the impossible, but you should get the idea. We do whatever it takes to ensure our customers are always happy. The one thing that we want to be remembered as is the pick of all brands that brought the solution to their home that they needed. And that it was a pleasurable experience all-around. Never forget that results and progress mean everything in the end. Not only do we stay in touch with our customers, we also supervise all of the processes of our door installers. We want to know how things are done to ensure they uphold our company standards. If we have to go back and redo it just to make it right, we will. The fact of the matter is that we aim to produce results that deserve to be featured in magazines as the leader of all brands within the industry. We want it to be the best solution all around. This is probably why we don’t get many change requests at the end of jobs. Who knows? Prove to set new standards, time and time again. 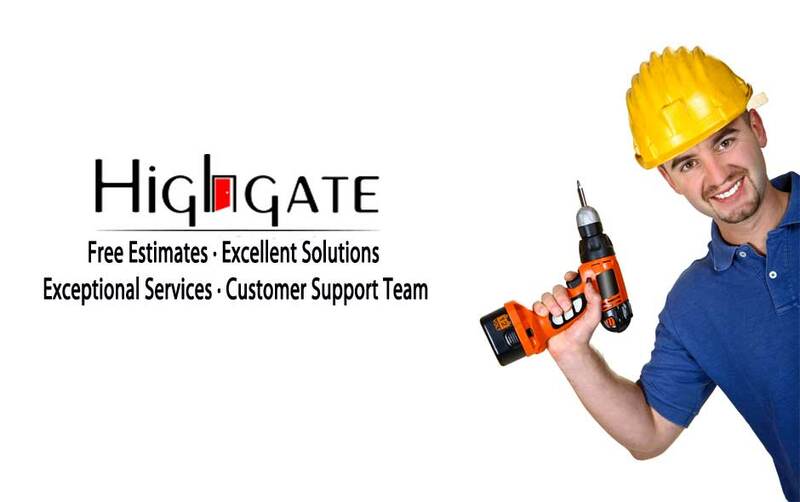 High Gate Doors is a company that hates being like the rest, and this is how we’ve continued to set new industry standards from within as well as with each door installer that works for us. It distinguishes us from the normal companies as today. A different kind of flavor demands a completely different recipe. This covers a few different aspects of the business including quickest repair times, ability to navigate unique problems, and much more. We aim to do better than we did the day before and this attitude has continued to take us to where we need to be. When an opportunity arises, we harness it without second thoughts. We know that opportunities don’t stick around forever, and that’s why as a leading door repair company we aren’t scared to grab them as they come. In fact, this has led us to the growth that has contributed to the company that we are today. All it takes is to go all in at just the right time. While a lot of door installer contractors will sit there and scratch their heads at taking something on, we’re getting the vehicle warmed up. When you want it done right the first time, and not take forever to happen, High Gate doors is the solution you need that’s knocking on your front door. Their passion has to shine or we write them off the list. We want to work with people that care about what they do. The ones that understand how much of an impact providing a door installer or door repair has on many people. That’s without mentioning the ones dedicated to honing their craft to where they’re the best in the business. Here are the top 3 things we look for to ensure this aspect is upheld by our team at all times. A previous dedication to honing their craft. By proving that one wants to further their knowledge of something (especially being a better door installer), proves they’re a priceless addition to a company. We also ensure our employees have the means to take their education further with ongoing training. Plus we keep them updated on industry breakthroughs and news as well. That’s right, we have alarms, bells, and whistles that go off to alert us to the freshest breakthroughs and news as it leaks. This is the only way to stay updated in a world that changes each and every day. Not to mention one that’s driven by tech. Be the first one to show up, the last one to leave. This level of dedication is hard to find in today’s world. It’s like a diamond in the rough. That’s why we expect all of our employees to show up a few minutes early. They don’t end the day until their tasks are done, whether it takes them longer than expected or not. This approach has ensured that we continue to live up to the expectations our customers have come to require of us. It has also led to a higher success rate when put in comparison with other door service companies of its kind. Has to maintain accountability for one’s own actions. In order to successfully grow, one has to know what was caused by them and how to own up to it. There is simply no way around it and we only like to employ those who refuse to beat around the bush. Instead, we aim to employ responsible professionals able to see their shortcomings and adapt to where they’re prevented from happening in the future. When you want to be the best NYC has to offer, enroll the most experienced. This is what helps us become one of the most trusted when it comes to door repair and door installations for both businesses as well as homes. Some of our employees have been in the business for decades, giving us the knowledge we need to take on just about anything. 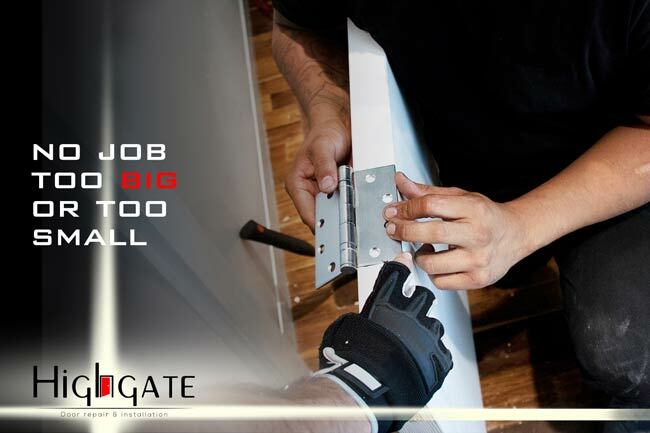 It’s not about taking shortcuts or hiring the cheapest hands to be a door installer here at High Gate Doors. It’s about scouting for the best in the industry and bringing them on the team. To produce the best results our customers have ever seen among any other company. Don’t forget to inject a boost into the quality of life of others. One thing that we stress to our team is that we have the chance to improve the lives of others through the services that we provide. By maintaining this focus, and ensuring its existence within our company throughout time, we have been able to gain quite the following. You’d be surprised, but this level of personalization seemed to be lacking in the industry, as many of our customers say it’s definitely much needed. We have heard horror stories and tales of disappointments, but this statement alone outweighs them all. BOTTOM LINE: Deliver next generation results that are unrivaled in NYC. We don’t want to knock the old ways of doing things, but there are times when the new ways are better. This is why we stay on top of technological breakthroughs in the door repair industry (whether exterior or interior). We want to be the ones to provide the needed change to the industry, time and time again. Not many service providers of our kind have this level of focus on the new ways of doing things. It also helps us accommodate all budgets & styles. While it’s unfortunate, we sure do like the competitive edge that it gives us. Putting us in a position where our competition can’t keep up with us easily. Don't forget, we offer solutions for all budgets & styles!